December courses begin officially on November 13 , when instructors send out the syllabus to students. The focus weekend takes place December 9-10, and final assignments are due January 11 (if you take the class for credit). 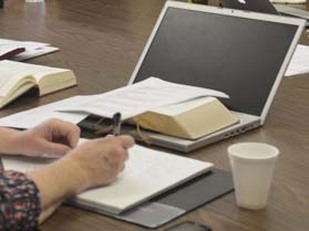 While the weekend begins with breakfast at 7:30 for students on ordination and lay license tracks, course instruction does not begin until 1:00 p.m., which gives you the flexibility of driving to Topeka on Saturday morning, rather than on Friday evening. If you are taking a class for personal enrichment or continuing education, you are welcome to spend the night at Upton Hall on Friday night, and join us for breakfast and morning prayer on Saturday morning. While the 8:45 colloquium session is a closed group for students on an ordination track, you are encouraged to join us at 10:15 for our praxis session, which addresses some practical area of ministry. If you would like to audit a course, the tuition is $100. If you would like to take the class for credit, the tuition is $180. The cos﻿﻿﻿t includes ﻿﻿﻿meals and overnight accommodations at Upton Hall on Friday and Saturday night (on a space-available basis). If you wish to take the class for credit, we encourage you to enroll by November 13. However, if you wish to audit the class, you may register at any time prior to the focus weekend. Christian Ethics is a field of study in which theological reflection is employed to develop a normative account of the moral life of Christians. Various accounts of the Christian moral life have been developed, practiced, and reassessed in relationship to developments in theology, philosophy, science, politics, art, and culture. Further, a broad range of Christian writings- theological, mystical, homiletical, devotional, academic, and practical - continue to inform the ongoing process of rendering a coherent account of how Christians are to live and act in light of the Gospel. This course acquaints students with Christian Ethics as a theological discipline and field of study, provides tools to articulate an account of the Christian moral life, and considers the relationship between theology and the practice of ethics in the life of the Church. Gill, Robin, ed. The Cambridge Companion to Christian Ethics, 2nd Edition. Cambridge: Cambridge UP, 2012. Markham, Ian S. Do Morals Matter? A Guide to Contemporary Religious Ethics. Malden and Oxford: Blackwell, 2007. The Rev. Andrew O'Connor is the rector of Good Shepherd in Wichita, Kansas. This course will explore classical doctrines of the First Person, including God, Trinity, Creation, Providence, Humanity, and Sin. Special attention will be given to the sub-themes of religion and science and the problem of evil and suffering. Schaab, Gloria L. If God Is for Us: Christian Perspectives on God and Suffering. Anselm Academic, 2016.